For five wonderful days I cruised on the MV Orient Pandaw along the Rajang River in Borneo. Pandaw ships are replicas of the old colonial river steamers, particularly the ones that sailed along the Irrawaddy in Burma. They’re finished in brass and teak but while they may look like the old river boats they’ve got air conditioning in all the cabins, the food is fabulous, the crew takes great care of everyone, you meet some really interesting people and go to remote, hard-to-get-to places. Borneo’s a land of mountains, rivers and jungle. Unfortunately large numbers of jungle trees are being felled and sent down the river on freighters, barges and occasionally the old-fashioned way in a log raft. This is decreasing the habitat of the many birds and animals unique to Borneo but you’re unlikely to see much wildlife along the rivers because these act as highways – communities build longhouses on the banks of the rivers and everyone seems to use small boats to get around. Our journey was called ‘Into the heart of Borneo’. This is the title of a wonderful travel book by Redmond O’Hanlon who went to many of the places we visited about thirty years ago. Many of the things he saw and did were instantly recognisable although we viewed them from the comfort of the Orient Pandaw rather than getting down and dirty with leeches, ants and mosquitos. We also drank considerably less tuac (rice wine) and its paint-stripper-like distilled offspring arak. We boarded the Orient Pandaw in Sibu, the largest port on the Rajang River, about 60 miles from the coast, and cruised upstream stopping at Kanowit and Kapit. We took side trips in the expedition boat Pandaw Adventurer - its shallow draft meant we could go along narrow tributaries and visit small communities. Check it out on the video. 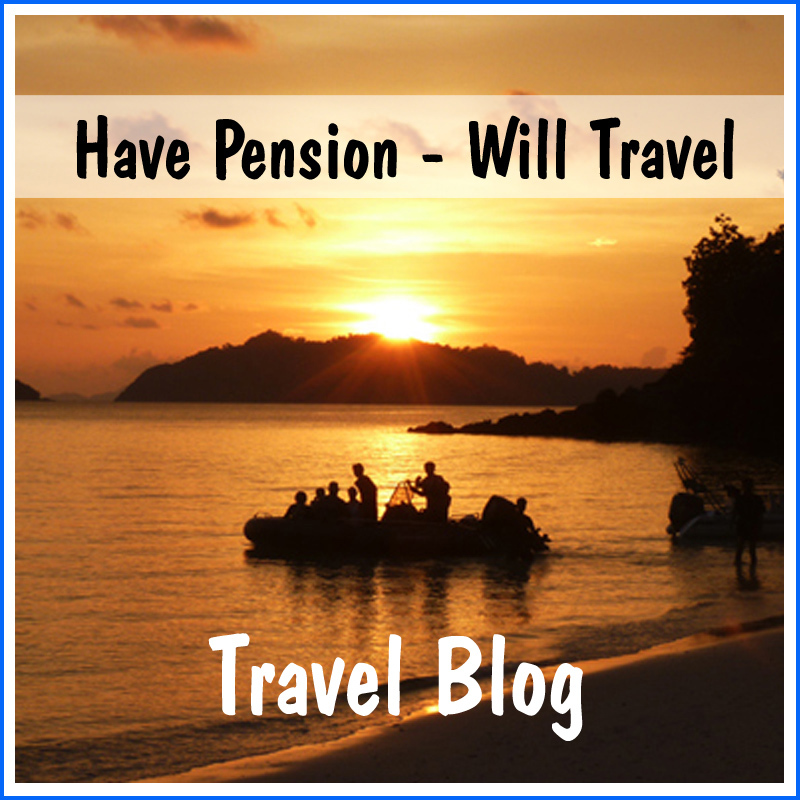 Borneo is a fabulous place and the Pandaw was a great way to see a small part of it. Time flies when you’re having fun! It’s been about a month since I last wrote but for much of that time I was in Sarawak, Malaysian Borneo. Borneo, the third largest island in the world (after Greenland and New Guinea) and home to orang utans and a variety of monkeys, is a long way from Rarotonga, one of the world’s smaller islands and home to politicians. Hmmm. Sarawak has a strange colonial history. In 1839 an English adventurer, James Brooke, helped the Sultan of Brunei put down a revolt and was given the governorship of Sarawak thus becoming the first White Rajah. Brooke set about supressing piracy along the northern coast of Borneo and increasing the size of Sarawak at the expense of Brunei. James Brooke was succeeded in 1863 by his nephew Charles Brooke who continued expanding Sarawak and ruled paternalistically for some 50 years until, in 1916, he handed over power to his eldest son. During Charles Vyner Brooke’s rule paternalism gave way to professional bureaucracy and in 1941 Brooke proposed a written constitution and gave up his autocratic powers. However at the end of 1941 the Japanese army invaded and took over Sarawak. There was no organised resistance but the local Iban warriors were encouraged to resume their old headhunting ways by Major Tom Harrisson, a larger than life Englishman who was recruited by the SEO to lead a small group of Australians behind the lines in Northern Borneo. Harrisson offered the Ibans ‘ten-bob-a-nob’ for Japanese heads and his blow-piping headhunters killed or captured 1500 enemy. Australian troops liberated Kuching in September 1945. After the war Sarawak became a British colony but it was given independence and joined the Malaysian Federation in 1957. The people I met in Sarawak seem to be quite fond of their White Rajahs who were certainly a lot more interesting and probably less destructive than most colonial powers. 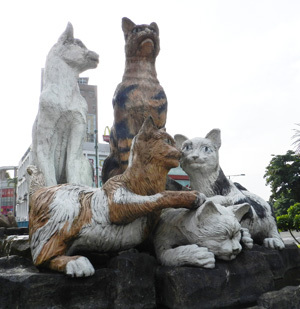 Kuching, the capital of Sarawak, has branded itself as ‘Cat City’. ‘Kucing’ is the Malay word for cat but it’s more likely that the name comes from the Chinese word for port ‘cochin’. Nevertheless Kuching has taken cats to heart. It boasts the world’s first cat museum although there are now others. It has an amazing array of cat statues and souvenir T-shirts, key-rings, charms and other bric-a-brac are in plentiful supply. It’s also got some fascinating food courts, markets and a great cooking class for those wanting to experience the ins and outs of local cuisine. Yeah, I loved being here and I’d go back again to check the things I missed out on. And to buy more cat T-shirts! Outside Kuching is the Sarawak Cultural Village where traditional houses, lifestyles, costumes, food and more are gathered in one very nicely landscaped area. But the highlight of my time in Kuching was a visit to the Semenggoh orang utan reserve. There's no guarantee that you'll see any - these fascinating animals are free to come and go as they please - but four dropped in to feed on fruit while I was there. Wonderful!